Get answers about AnyRecover related technical questions. 1. How does AnyRecover Work? Whenever you use the delete button on in your computer, it will show the file as deleted but allocates a portion of your drive to the file in the recycle bin. This file will remain in the recycle bin and can be recovered back to its original state. But, the bad news is that your system will eventually reuse this space and also overwrite the pointer to the file, so the quicker you stop using your computer and run Anyrecover, the better your chances of recovering your files. What’s more, even when you’ve emptied your recycle bin, Anyrecover can still help you get back the lost or deleted files. 2. I’ve Deleted Some Files by Accident, HELP! Ideally, you should install AnyRecover before you need it. This is because it can have the time to monitor your drives for deleted files as soon as possible. If you accidentally delete an important file and you decide to go online to download AnyRecover (or download anything), this process can create a lot of temporary files which can overwrite the memory space allocated to the deleted file and before you finish the installation, the deleted file is gone. If peradventure you mistakenly deleted an important file and you have AnyRecover installed on your computer, all you need to do is to run your AnyRecover and have your file back. You can download and install your own copy of AnyRecover here: Download AnyRecover for Win & Download AnyRecover for Mac. 3. What If the Hard Drive Cannot be Detected by My PC, Can I Recovery Data from It? We are very sorry to say that if your hard drive cannot be read or detected by your computer, then there is absolutely NOTHING AnyRecover can do to extract data from it. The drive needs to be identified on your computer before any further action can take place. You need to send the hard drive for fix. 4. Why Can’t Some Files be Previewed? Pictures: JPG, TIF, PNG, BMP, GIF, PSD, CRW, CR2, NEF, ORF, RAF, SR2, MRW, DCR, WMF, DNG, ERF, RAW, AIF, and HEIC. Documents: DOC, DOCX, XLS, XLSX, PPT, PPTX, PDF, HTM, HTML, ZIP, and RAR. At the moment, only the supported files can be previewed by AnyRecover but this does not mean that the files cannot be recovered. In case you find your lost file but cannot preview it, we suggest you recover all the files and use the right program to run it. That way you get to know if your desired file is recovered or not. 5. What to Do When Lost Files Cannot be Found? 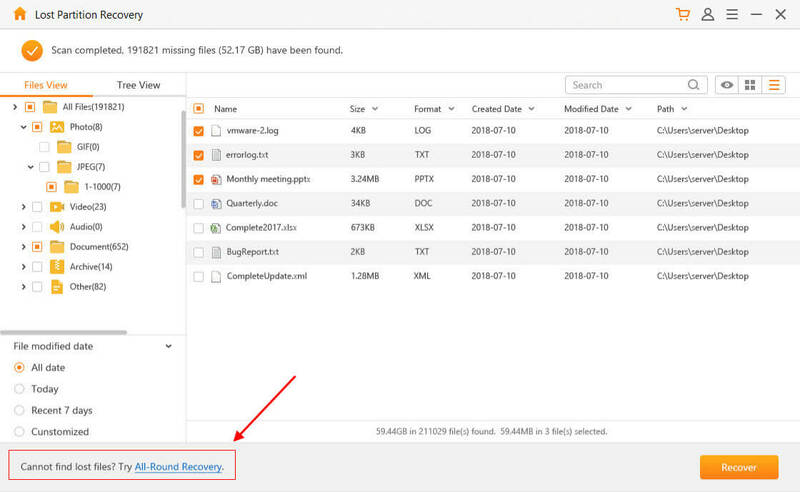 After a successful scan for your deleted files is complete and you are unable to locate the file you were looking for, we suggest you run an “All-Around Recovery” on AnyRecover. This will search your drives for all types of deleted files. 6. Why does the Software Fail to Recognize the External Hard Drive? The software may fail to recognize the external drive if it is not properly plugged in or it is damaged. In some cases this may be due to a problem with your computer system, we, therefore, suggest that carry out the following to rectify the issue. 7. Why Some Recovered Files Can’t be Opened? When the memory space allocated to the recovered file has been corrupted or overwritten. This may be due to the file storage mechanism which assigns a part of the Windows storage to your deleted files and overwrites them with other data over a period of time. This may tend to corrupt your recovered file. 8. Why Can’t Drive be Found by AnyRecover for Mac? When your Drive can’t be found by AnyRecover for Mac, we suggest you open the Disk Utility to check the status of the drive. All the links to the devices will be listed under the Disk Utility and you will be able to know if the drive is damaged, listed or not. 9. Can You Guarantee That I Can Recover A Specific File? Because Data recovery from a computer storage system is linked to so many factors, we CANNOT guarantee that you will be able to recover a specific file. The only thing we can guarantee is the fact that you can be able to verify it with AnyRecover at all times. Since each recovery case is unique, provision of a universal recipe can be very tasking. To increase your chances of recovering documents, we suggest you download AnyRecover even before you need it. 10. Why My Camera Doesn’t Show up After the Connection? Cameras may come with different file protocols which may not be recognized by AnyRecover. If you connect your digital camera to the computer through a cable and you discover that it is detected by your computer system, we suggest you turn on your camera. You can also try to pull out the memory card and insert it directly to the computer system port assigned to it. 11. What’s the Difference Between Free Trial and Full Version? The free trial version allows you to scan and preview the scanned files for free. You are allowed to recover 3 files. If you are satisfied with the level of recovery you obtained, you can go ahead and purchase the full version for a total recovery of the files. After a successful payment, you will receive a registration email which includes your registration key and a download link to the full version of the program. 12. Can I Recover the Data Deleted One Year Ago or Even Longer Time Ago? Only files whose allocated memory space has not been overwritten can be recovered by AnyRecover. If you have a lost data on your system that is one year old and the memory space allocated to it is not yet overwritten, then you can recover the files. The ability to recover a file is not based on its date of deletion but the availability of memory space allocated to it. 13. What does RAW Files Mean? If file system is intact, folder structure could be restored. If file system is incomplete or corrupted, all files will be in the RAW Files folder and lose their original names. Files in the All RAW Files partition are found over file system, so they lose original names and date. 14. How Long does a File Recovery Take? As far as file recovery options are concerned, there are several factors that come into play to determine the amount of time needed for all files to be recovered. Size of the drive; the larger the drive size, the longer it takes for AnyRecover to scan through and recover your deleted files. While smaller drives (usually less than 500GB) may take between about 30 minutes to fully recover, larger files (up to 1TB) may take hours and days. Nature of the file: If the file is corrupted or damaged, it will also affect the total amount of time needed to recover the files. If the scan is progressing, do not stop your scan because you feel it is taking too long to recover data from larger drives. 15. Can Files be Recovered from a Formatted Drive? Absolutely YES! AnyRecover has the ability to recover files even from a formatted drive. This is, however, dependent on the level of formatting carried out on the drive. The formatting needs to be a file supported by AnyRecover (NTFS, FAT16, FAT32, exFAT, APFS, HFS+, HFSX ). If the drive has been previously erased before being re-formatted then, it may decrease the chances of being recovered. 16. How Large does the Hard Drive I’m Using to Save Recovered Files Need to be? This totally depends on the size of all the files you are trying to save. If after a successful recovery, you discover that there are some recovered files that may not be useful to you. In most of the cases, the total amount of storage space required to save the recovered files may be far larger than your actual file size. The best option is to run filter out the files that are not useful to you in order to reduce the total amount of space needed for storage.